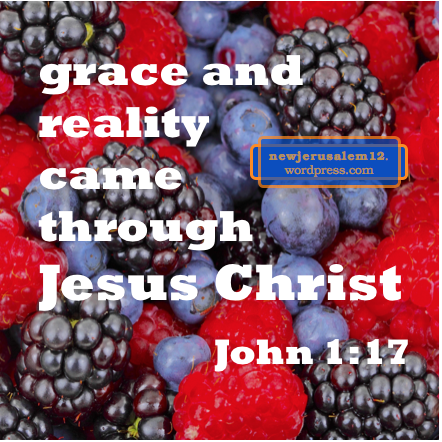 Christ is the reality (John 14:6) and is full of reality (John 1:14). John told us, “One of the seven angels…spoke with me, saying, Come here; I will show you the bride, the wife of the Lamb. And he carried me away in spirit onto a great and high mountain and showed me the holy city, Jerusalem, coming down out of heaven from God” (Rev. 21:9-10). The Lamb, Jesus Christ, and the bride, New Jerusalem, have the unique marriage. Other marriages are a shadow of this one, just as positive people, things, and events in the Bible are shadows of Christ or our relationship with Him (Col. 2:16-17). This unique marriage is presented in John 3:29-30. John the Baptist, responding to a question about Christ, said “He who has the bride is the bridegroom;….He [Christ] must increase, but I must decrease.” The increase in verse 30 is the bride in verse 29, composed of all who have received eternal life (3:15-16). The unique marriage is also touched in 2 Corinthians 11:2. “I am jealous over you with a jealousy of God; for I betrothed you to one husband to present you as a pure virgin to Christ.” Here Paul considers the believers in Corinth as one virgin engaged to Christ. The fuller presentation of the unique marriage is in Ephesians 5:23-32. Human marriage is a picture of the marriage of Christ and the church. This is a “great mystery.” Christ gave Himself for the church in His death (v. 25), now He is sanctifying her by the washing of water in His living word (v. 26), and He will present her to Himself glorious when He returns (v. 27). Eternal life in John 3, Paul’s labor in 2 Corinthians, and the Lord’s actions in Ephesians 5 all point toward New Jerusalem, the marriage of Jesus Christ and His believers, beginning with the wedding feast in Revelation 19. 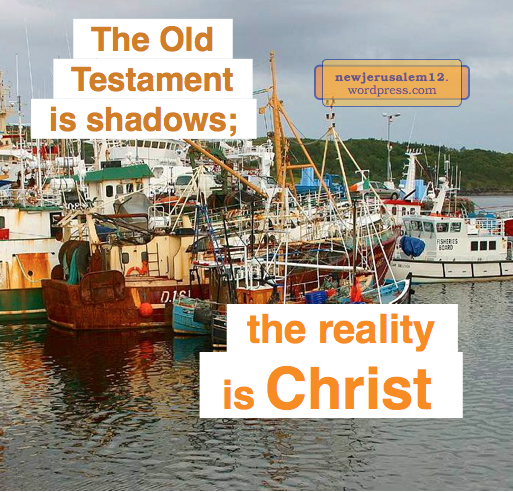 The Old Testament shadows were necessary until the incarnation, death, and resurrection of Jesus Christ. Reality came in His incarnation and reality was made available to us in His resurrection. In this reality we have no need of a physical temple but He and we together are the living temple. And New Jerusalem is the ultimate temple in the Bible. We have no need for a physical temple, but that temple, the shadow, shows us much about the present living temple. In addition to the materials and shape, the contents of the physical temple are important. Since the entire New Jerusalem is the holy of holies, we will look only at the physical holy of holies to get a picture of New Jerusalem. The ark was made of wood, overlayed inside and outside with gold. This portrays Jesus Christ as the man (wood) mingled with God (gold). Everything is in Him. This ark is “of the covenant.” This covenant is a definite promise, a commitment by God. Everything portrayed by the ark is guaranteed by God. Thank Him! The golden pot with manna is the eternal life supply in New Jerusalem. 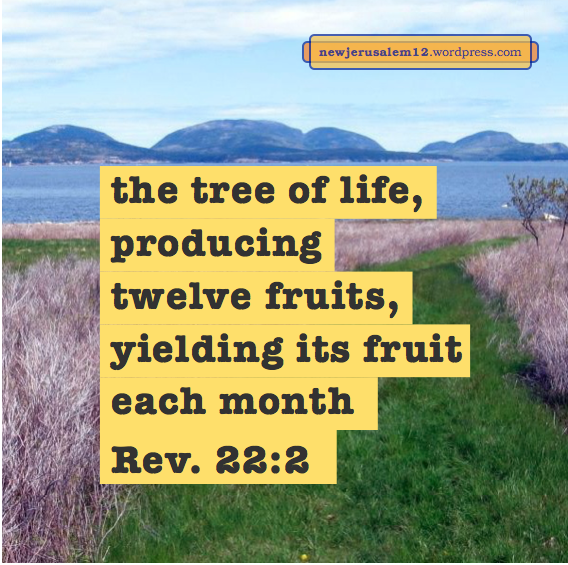 This is the same manna that fell around Israel’s camp, but its location indicates a much deeper, inner experience* of this life supply.This corresponds to eating the fruit of the tree of life in New Jerusalem (Rev. 22:2). *This footnote, from the ministry of Witness Lee, presents the experiences of Christ as seen in all three parts of the tabernacle. The devil is not in New Jerusalem and has no way to bother us in New Jerusalem nor to bother the nations around New Jerusalem. First John 3:8 tells us “the devil has sinned from the beginning.” The devil is the source of sin which brought in death. 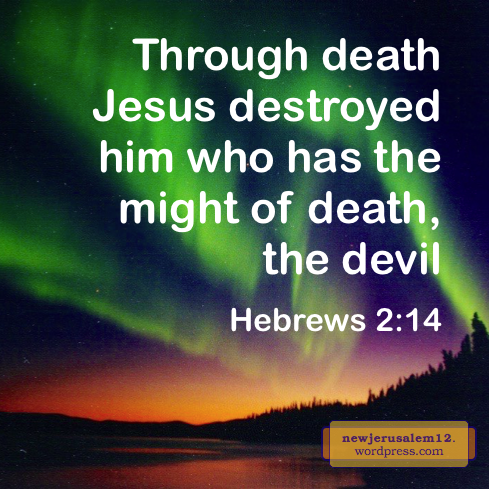 John 8:44 tells us that the devil is a murderer from the beginning and that he is the father, the source, of lies. The nature of the devil is a lie because truth is not in him. This is the exact opposite of New Jerusalem in which Christ is the life and reality and where there is no lie. It seems to us today that the devil is still active. The reason is that the judgment accomplished on the cross has not fully been carried out. Therefore, Ephesians 4:25-27 warns us to put away lies and anger so that we give no place to the devil. We wage this battle continually by applying the law of the Spirit of life (Rom. 8:2) to overcome the law of sin in our flesh (Rom. 7:20). In Revelation 12:9 the devil is cast down and in 20:2 he is bound for a thousand years, and in 20:10 he is cast into the lake of fire. This is the final step of the judgment accomplished on the cross. As a result, the devil will never bother New Jerusalem nor the entire new creation. And, since the devil is Satan, New Jerusalem has Neither Sin nor Satan. Here is a summary of all posts about what is NOT in New Jerusalem. Photo courtesy of NASA and JPL. 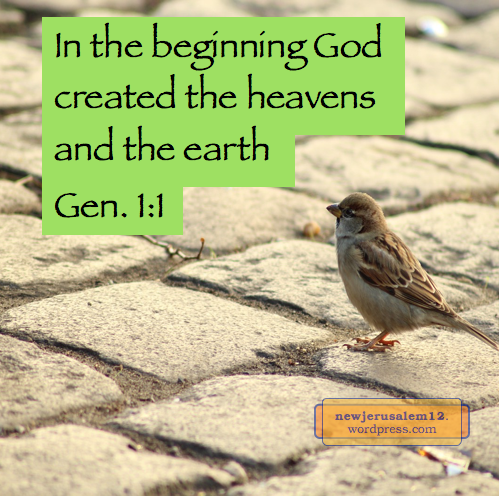 What is the adorning of New Jerusalem? Let us ask the Bible, putting aside any natural ideas. The first use of adorn in the New Testament is Matthew 23:29, “Woe to you, scribes and Pharisees, hypocrites! For you build up the graves of the prophets and adorn the tombs of the righteous.” Any outward adornment without inner reality is hypocrisy; surely this is not New Jerusalem. Next, Luke 21:5 says that “the temple…was adorned with beautiful stones and consecrated offerings.” In the following verse the Lord says this will be torn down; clearly this outward adorning was not precious to God. Thirdly, 1 Timothy 2:9 instructs “that women adorn themselves in proper clothing with modesty and sobriety, not with braided hair and gold or pearls or costly clothing.” Again, adorning (both in this age and for New Jerusalem) is not something outward but rather inward virtues. First Peter 3:3 is the same. Titus 2:9-10 exhorts “slaves to be subject to their own masters in all things, to be well pleasing, not contradicting, not pilfering, but showing all good faithfulness that they may adorn the teaching of our Savior God in all things.” This teaching, which is with grace (v. 11), should soak into our inner being to become our pleasantness and faithfulness and wash us from arguments and greed. This is an adorning for which the Lord looks. First Peter 3:5 is comparable. These verses tell us that the adorning of New Jerusalem is inward, not outward. The next post will look more specifically at what constitutes the adorning of New Jerusalem. 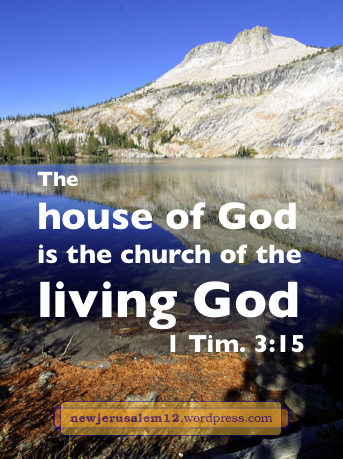 The church is the living house of the living God and is God manifested in the flesh (1 Tim. 3:15-16). New Jerusalem is the enlargement, the expansion of the church with God’s Old Testament people. The prior post focused on Colossians 2:19—the church’s growth (increase) to New Jerusalem is by the growth (increase) of God—God in Christ spreading and increasing in us. In Colossians 2:16–3:4 this growth is by our experiencing Christ as the reality of every positive thing, by holding Him as our Head, by our mind being set on things of Christ above, by being governed by Christ Himself rather than by outward ordinances, and by letting Christ our life live in us. All of these contributors to growth characterize New Jerusalem. In New Jerusalem we will be full grown with Christ as the reality of everything, we will be fully occupied with the things of Christ, we will be governed by God and the Lamb on the throne, and He will be our life and our living. Lord, keep us with Yourself every day that You may grow in us unto New Jerusalem! First Timothy 3:15 tells us “the house of God is the church of the living God.” This house will be enlarged to be the city of God, New Jerusalem. 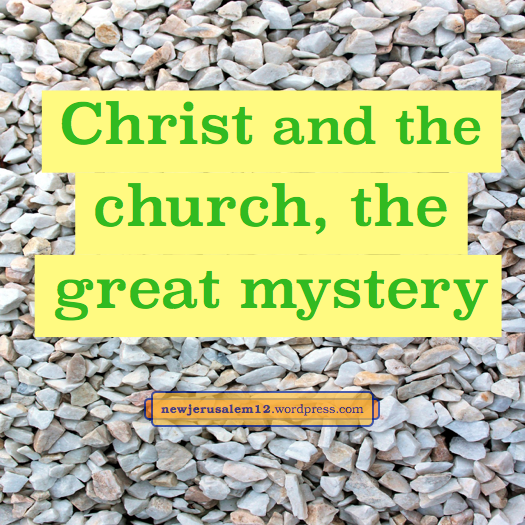 At Timothy’s time, the word church did not denote a physical building. The word referred to God’s people. The believers in Timothy’s time were the house of God. Today we are the house of God. In eternity all God’s people will be His city, New Jerusalem. Many more examples can be seen in the following books of the New Testament. The tabernacle and temple as the house of God in the Old Testament were pictures of what God desires. Jesus Christ is the reality (John 2:19, 21). Through death and resurrection we have been brought into Him to be the enlarged reality of the temple (1 Cor. 3:16). This house, this temple, grows with “the growth of God” (Col. 2:19) through the New Testament. The full growth of this “house-temple” will be the “city-temple” New Jerusalem. The characteristics of New Jerusalem will be the same as the house of the living God except much greater in quantity, much richer in expression, and without the present distractions of our fallen nature. Israel’s journey to Mt. Sinai depicts our Christian journey to a point where we are “carried away in spirit onto a great and high mountain” to see New Jerusalem (Rev. 21:9-10). This paralleling of Israel and Christian life is seen in 1 Corinthians 10:11, “Now these things happened to them as an example, and they were written for our admonition.” Thank the Lord for the Old Testament examples and for the fact that “they were written” for our sake. The same is seen in Romans 15:4, “For the things that were written previously were written for our instruction, in order that through endurance and through the encouragement of the Scriptures we might have hope.” Again, thank the Lord! The Bible gives us instruction and encouragement and with these we take the Lord as our endurance. Israel journeyed to Mt. Sinai, received the vision of the tabernacle, built it, and brought it into the good land. Later the tabernacle was enlarged and made more solid with the building of the temple in Jerusalem. All of this history is for our instruction, admonition, and encouragement. And all this history points toward New Jerusalem. 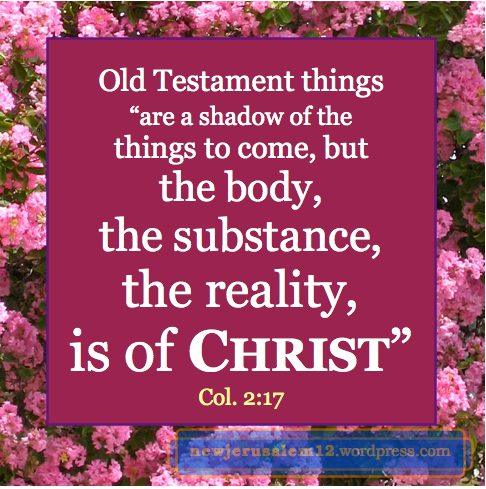 All this history was a shadow of Jesus Christ, the reality (Col. 2:16-19). Our job today is to hold Him that He may grow in us to fill us with reality (2:19). Today this reality is in the Body of Christ as God’s and our dwelling which will be enlarged to become New Jerusalem as God’s and our eternal dwelling. The Fall 2012 issue of Affirmation & Critique* focuses on New Jerusalem. 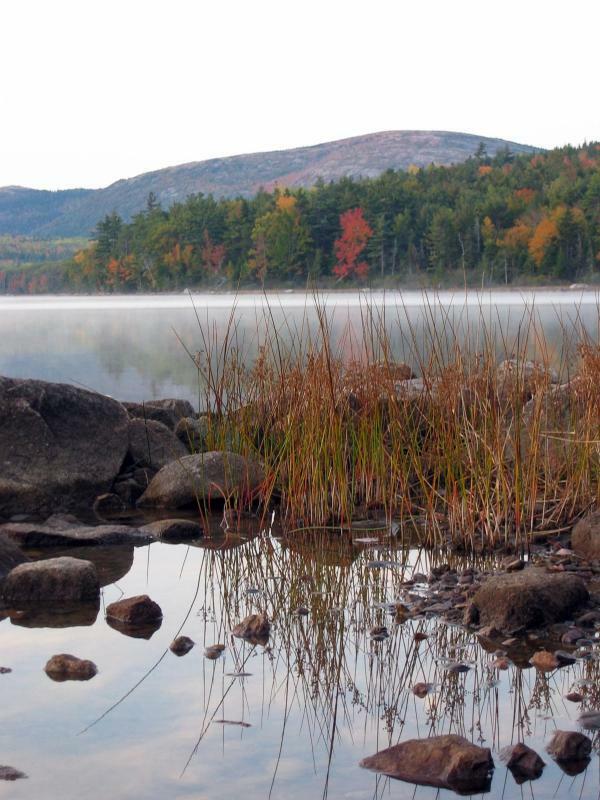 Beginning with this post, I will present an excerpt from each article in this publication. What I present is only a brief nugget, not a summary of the article; the whole can be read online. 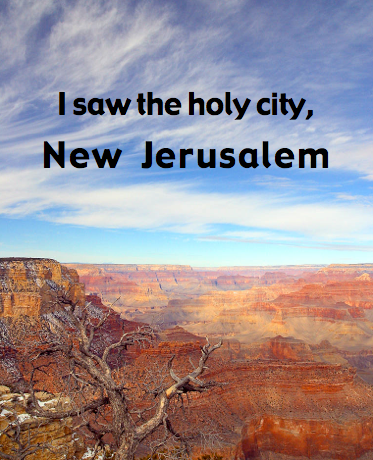 The title of the first article includes John’s words from Revelation 21:2, “I saw the holy city, New Jerusalem, coming down out of heaven from God.” “I Saw the Holy City, New Jerusalem”—the Vision of the New Jerusalem as a Corporate God-man (by Ron Kangas). Just as Christ the Redeemer is not literally a lamb with seven physical eyes (5:6), the New Jerusalem is not a literal city but a sign of the glorious fulfillment of God’s eternal purpose, according to the desire of His heart, to have a corporate expression of Himself in Christ as the firstborn Son and the believers in Christ as the many sons. John the Baptist “saw Jesus coming to him and said, Behold, the Lamb of God” (John 1:29). This is a reference to the Old Testament sacrifices. Those physical lambs served as a figure, a portrait, of Jesus Christ as the real Lamb of God. John the apostle saw “a Lamb standing as having just been slain.” Here, as in John 1, the Lamb is not a literal animal, but a symbol of Jesus Christ. Furthermore, this Lamb has “seven eyes” which are not literal but “are the seven Spirits of God” (Revelation 5:6). Spiritual symbolism permeates Revelation. New Jerusalem is a symbol. 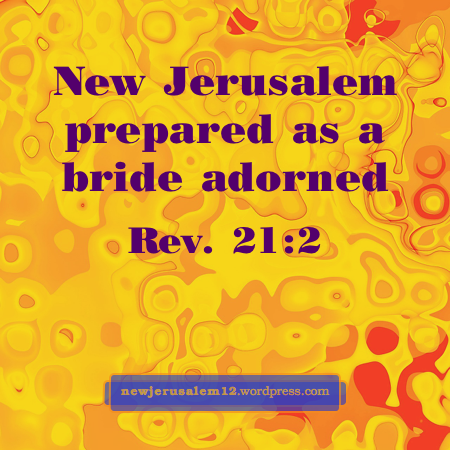 New Jerusalem is not a physical city because it is “the bride, the wife of the Lamb” (Revelation 21:9-10). The Lamb is God, who put on humanity. The Lamb’s wife is humanity who has received divine life. May the Lord give us such a revelation of New Jerusalem. • John saw no temple in the city because “the Lord God the Almighty and the Lamb are its temple” (21:22). • New Jerusalem “has no need of the sun or of the moon that they should shine in it, for the glory of God illumined it, and its lamp is the Lamb” (21:23). • The center of New Jerusalem is “the throne of God and of the Lamb” from which flows the river of water of life with the tree of life (22:1-3). Jesus is the reality of all the Old Testament lambs. John the Baptist “saw Jesus coming to him and said, Behold, the Lamb of God” (John 1:29). Further-more, 1 Corinthians 5:7 tells us that Christ is our Passover. He is not only the reality of the passover lamb but also the reality of every part of the passover. In New Jerusalem we will have the eternal feast and the eternal memorial of Jesus Christ as our Lamb who redeemed us and forever nourishes us. More about the lamb and passover is in Life-Study of Exodus, chapters 23-25.